What type of risks does an artificial wrist joint bear? Are there any other specific risks? What needs to happen in case an artificial joint has to be removed? It will not be possible to list each individual potential risk at this point but generally speaking there is a risk of infection which cannot be excluded. In case of a superficial infection affecting just the soft tissue the therapy approach consists of simply administering an antibiotic, possibly the early removal of the stitches. A deep-laying infection however affecting the joint itself is a much more serious matter. In this case the joint will have to be removed again. Many times this triggers a series of revision surgeries. Yes, artificial joints are known to be prone to become loose or even break off the bones. This is an indicator for a non-functioning replacement joint. In some cases only a revision surgery will help to address the issue. Complication following the implantation of a wrist joint prosthesis. 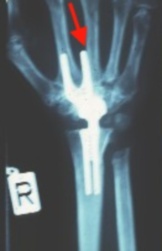 The Meuli prosthesis seen here broke off at the third metacarpal bone (arrow). A case like that usually ends up in an arthrodesis of the wrist joint. This type of arthrodesis will always require the extraction of bone from the iliac crest which then needs to be transplanted into the wrist joint meaning that we are looking at a much more difficult procedure as if there hadn´t been an artificial wrist joint in place. Nevertheless total wrist arthroplasty remains a possible and appropriate option in a case like this and will oftentimes help achieve the desired pain relief (even if at the expense of the mobility of the wrist joint).